Like oxygen, privacy is an odorless, colorless substance usually taken for granted. It is deeply rooted in both the personal and the social, evoking a range of human responses. Political and technical developments have have altered privacy's ecosystem of expectations, laws and behaviors. To expand the dialogue on visual privacy, we set out to demonstrate - to make visible - concrete examples of privacy in practice. Commissioned by the Whitney Museum, we installed a state-of-the-art robotic webcamera over UC Berkeley's Sproul Plaza, birthplace of the Free Speech Movement. For six weeks, the camera was made accessible to anyone on the Internet. Online participants shared remote control of the robot camera, allowing them to zoom in to frame and photograph activity on the Plaza at any time of day or night. 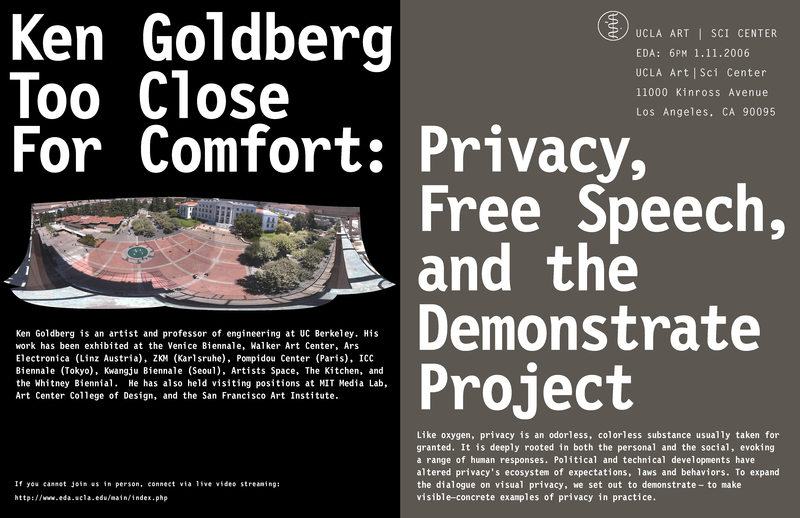 During the six-week course of the installation, over 1100 images were taken, putting public activity in Sproul Plaza under scrutiny and placing online participants in the position of hidden observers. The installation provoked a range of reactions. I'll describe what was observed, the controversies, and illustrate with images taken by users.